The AquaCalc has the current meter rating equations for many standard United States Geological Survey (USGS) meters built in when shipped to the user. 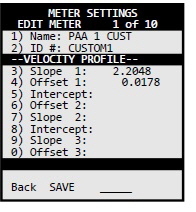 The AquaCalc can also accept custom current meter equations for non-standard USGS and European type horizontal axis meters. Most contact type current meters can be used with the AquaCalc if the rating equation is known from calibration tests. In addition to the built-in current meter rating curves for the Price AA and Pygmy meters, the AquaCalc can store rating curves for user defined “non-standard” current meters including OTT type meters and Hydrological Services Redback Price AA type current meter. Please See the “Meter Setup” section in the AquaCalc Pro Plus Instruction Manual for more information onthe use of, and setting up current meters in the AquaCalc Pro Plus. 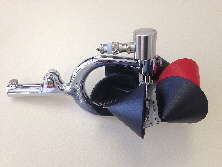 The manual can be downloaded here. 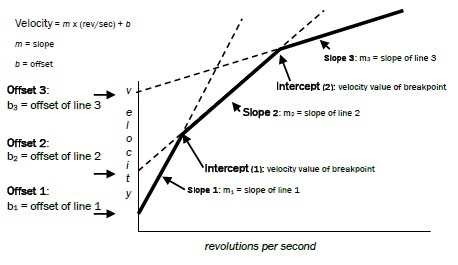 As used by the USGS, meter rating curves are either a single or pair of equations that define the relationship between the number of revolutions per second (counts divided by time) of the current meter cups and the measured velocity. These equations are use to create the meter rating tables used in manual measurements. Non-standard current meter ratings can be defined in several segments, one of which is used for lower velocities, the other segments for progressively higher velocities. Each segment is represented by an equation. A crossover or “breakpoint” velocity value is also specified that indicates the velocity at which the next equation is used. Where m is the slope of the line and b is the value where the line intercepts the velocity axis (which in the AquaCalc is identified as the “Offset”). The AquaCalc can handle non-standard meter rating curves with up to three line segments representing three velocity ranges. The “Intercept” value in the AquaCalc represents the crossover or breakpoint velocity value at which second (or third) segment is used. 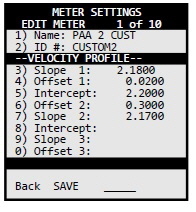 Use the right arrow navigation key to select a new meter to specify. Press number 3) Type: to select the type of meter which should be set to “NonStd” or Non-Standard. Press number 4) Units: to change to “METRIC” if required. Using the “More” Soft-Key, go to the next page where meter rating values are entered. Utilizing keypad number 3 through 0, enter meter constants from the current meter rating equation. Be sure to test and confirm the meter and meter ratings before using in the field. Multipart USGS current meter ratings use a crossover velocity instead of the n = revolutions per second crossover point, but these are easily converted. From the table attached to your rating, the 0.14 rev/sec is equal to 0.332 ft/sec, and the 2.69 rev/sec is equal to 6.173 ft/sec. 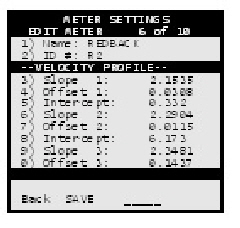 The USGS traditionally uses a specific format for multipart ratings, V= Slope1 * R + Offset1 (VC) Slope2 * R + Offset2, Where R is revolutions per second, and VC is the velocity at the crossover point. Horizontal Axis Current Meters that use a contact closure, like the OTT horizontal axis current meter, and the Rickly Hydrological Universal Current Meter - Model 6500, can be used with the AquaCalc Pro Plus by entering a Non-Standard Meteras discussed above, and using the current meter rating equation provided by the manufacturer. This type of current meter uses different “propeller” sizes. Each propeller size has its own rating equation, and must be entered as new and different Non-Standard Meter in the AquaCalc.